We are Dave Morgan and Susan Tate. 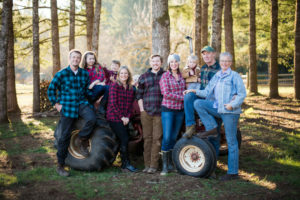 We have been married 40 years and raised two kids in the suburbs of Portland before trying out our long-held dream of having a small farm. 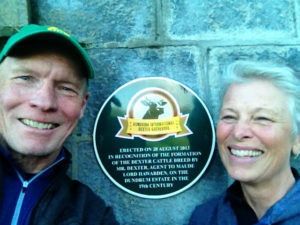 In 2008 we found our 10-acre farm in Beavercreek, Oregon. Dexter cattle were originally bred in Ireland to be the perfect cow for the small farm: providing milk, beef, and if needed draft power. We have found that Dexters are the perfect cow for our farm. In addition to being a smaller breed (2/3 the size of a Hereford), they are mild tempered, hardy, and calve easily. We began this venture simply to provide our extended family with wholesome nutritious, humanely raised beef. In the process, we fell in love with the animals, became breeders and acquired some excellent genetics, and now offer what we think is some of the finest available Dexter breeding stock in the country. We named our herd “Hifalutin” and it was somewhat tongue-in-cheek at the time, but they really are beautiful animals and we hope that you will visit our farm to see for yourself what an amazing breed this is.